Last year I heard a series of presentations from some first responders on the April 17, 2013 West, Texas fertilizer plant explosion. The blast killed 11 firefighters at the scene and injured 200 of the 2,800 inhabitants of the town. The presenters, from the police, fire and emergency medical disciplines, assumed leadership positions when they arrived on scene and described the actions that they took at the first large disaster of their lives. The week of December 7-11 the American Red Cross assembled a team of 18 people in Denver, Colorado to draft a reference guide for local Red Cross employees and volunteers to use when they have to respond, as those men did in West, Texas, to the first large disaster of their lives. When FEMA Administrator Craig Fugate was a State Director in Florida I heard him define the difference between an emergency and a disaster. At most emergencies, like a house fire or an automobile accident, the first responders outnumber the survivors. When an event happens, and the survivors outnumber the responders, then you have a disaster. Across the nation the Red Cross responds to emergencies every day. In 2015, Red Cross disaster workers responded to 176 large U.S. disasters – more than each of the past three years. Not everyone with the responsibility to recognize and react to a growing disaster has the benefit of having done it before. The first responders in West, Texas didn’t, and many of the Red Cross employees and volunteers on the ground during those 176 disasters didn’t either. I knew and had served on disasters with a good number of the Team that assembled in the Drury Hotel in Denver. Before we could start we had to define the problem that we were addressing, the solution to the problem and the intended audience for whatever document we ended up producing. As was to be expected from such a diverse and experienced group, we had significant disagreements. Fortunately, we were joined by some experienced facilitators who had ample experience corralling ornery and rambunctious groups like us. 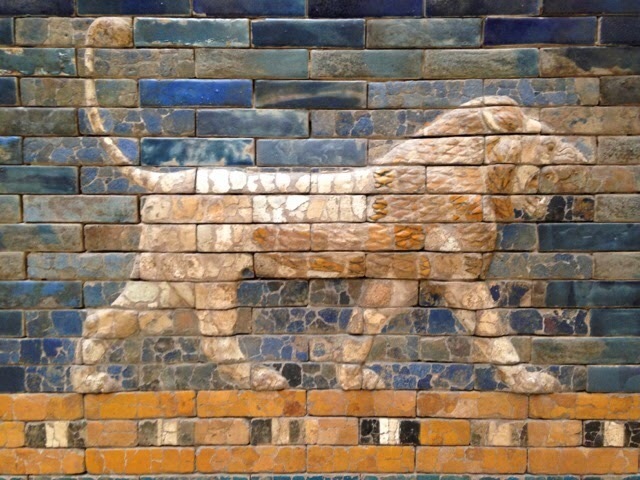 This wall was used by the Team to determine the target audience for our Field Operations Guide. This week in Denver was one of the highlights of my mass care career and I felt fortunate to have been in the room with such a knowledgeable and dedicated group of mass care professionals. In particular, I learned a lot. I learned a lot about how to establish and operate a Red Cross Disaster Relief Operation. The most rewarding part of the week was that I was able to use my hard earned knowledge and experience to contribute to the effort that we were all making. After five long days, working in groups, we were able to assemble a rough draft of over 100 pages. The target audience for this Field Operations Guide is the Regional Disaster Officer and Disaster Program Manager at the front line of the Red Cross disaster response hierarchy. The Guide is a series of checklists and job aids by function: Job Director, Operations, Planning, Logistics, Finance and External Relations. It’s a good product and we were all pleased with the result. The draft has now been turned over to the doctrine staff at Red Cross National Headquarters, who will use their superior command of the English language to transform our scribblings into readable prose, with all the periods and commas in the right place. Once they have finished their magic the draft will go out to a wider audience for comment. The intent is to get this product completed and out to the field by spring. If that sounds ambitious, it is. But we think that we can get it done. I got a call from my Red Cross buddy Julie Schoening on a Sunday evening and she said that I was wanted in California to help with the wildfires. “When do they want me to leave?” I asked. in the Cobb Community of the Valley Fire. The next morning at 9 AM I stopped by the Capital Area Chapter to pick up my travel documents and then I was off to the airport. Sharon Tyler, the CEO of the Chapter, advised a reporter from a local television station that I was being deployed and gave her my contact info. The reporter called when I was going through security so I asked her to call me back. Once I was through security and had a cup of coffee in hand I sat down to do the phone interview. Some people are nervous about talking to the media. I didn’t recall reading the Red Cross memo on media interviews but I didn’t see any harm as long as I: a) spoke about things for which I direct knowledge, and b) focused on the positive, as opposed to the negative. If they were looking for a spokesperson for Gail McGovern then I wasn’t their man. I was a volunteer from Tallahassee, off to the Left Coast to save California, and that’s what I talked about. I made the noon and 5 PM news shows and they didn’t garble too much of what I said. This was only my second deployment as a Red Cross volunteer. My first deployment as a volunteer was in 2012 when I was sent to the New York City Disaster Relief Operation in Manhattan at the corner of 10th Avenue and 49th St for the Sandy response. If you want to read about the exciting times that I had in the Big Apple go to here and here. Speaking of exciting times, after my interview I boarded a flight to Miami, where I changed to the middle seat of a 7-hour flight to San Francisco. After some adventures, which are a story for another time, I was able to save the Red Cross the cost of a hotel room by sleeping at a friend’s house in Santa Rosa, an hour and a half north of the airport, where I laid my weary head down long after my customary bedtime. morning of September 22, 2015 when I arrived. On Tuesday morning, September 22, I reported to the Disaster Relief Operation Headquarters at Hidden Valley Lake. I went through the check-in process with the people at the Headquarters in charge of keeping track of which people and what stuff are assigned to the disaster. This is an important job. On one of the hurricanes I worked on with the State we spent 2 months after the disaster looking for a rented trailer. If you’re not paying attention, that’s easy to do. They gave me a laptop computer and the address for the Lake County Emergency Operations Center and sent me on my way. The so-called “Valley Fire” was the 3rd most destructive in California history, or so I heard from more than one local emergency manager when I was there. The State of California Situation Report of 9/13/15 stated that the fire started in Lake County at 1325 hours on September 12. By October 2 the fire had destroyed 76,868 acres and 2,663 residences. I had seen some of this destruction as I passed through Middletown on my way to Hidden Lake that morning. Light filters through the trees at a home destroyed by the Valley Fire in the Cobb Community. My GPS sent me north toward the southern shore of Clear Lake, the largest lake in California (Lake Tahoe is partly in Nevada). Unsure of the provisions at my destination, my infantry training kicked in (i.e. never pass up an opportunity to eat or sleep) and I grabbed a chicken sandwich in Lower Lake on the way. I didn’t have to buy another meal for 10 days. The Lake County EOC was housed in the banquet room of a Casino on the Lake. The bathrooms were in the Casino so in the next week I made numerous trips between the rows of slot machines, self-conscious of my Red Cross hat and well aware that no amount of explanation could overcome the photo and caption: RED CROSS VOLUNTEER ON VALLEY FIRE CAUGHT GAMBLING IN CASINO. The Lake County EOC in the Banquet Room of the Casino. Like almost anything else, the best way to learn about disaster response is not by reading about it but by deploying and working on events. I have worked a lot of disasters, but very few at the County level and even fewer as a Volunteer. Plus, I’ve worked a lot of hurricanes but very few wildfires, and this was a big wildfire. Consequently, I learned a lot. Lake County has a population of 63,860 so their County Emergency Management was woefully under equipped to handle a disaster of this size. No county jurisdiction in the nation is staffed to handle The Big One. That’s what Mutual Aid is for. When I arrived in the Lake County EOC I found a room filled with tables, chairs, computers, wires, maps and local emergency managers from all over the state coordinating the disaster. The sudden destruction of a large portion of the housing stock in the County made a roof and a bed a premium item for survivors, responders and Red Cross volunteers. This put the Red Cross in the business of sheltering not only survivors but Red Cross staff and volunteers as well. I hadn't slept on a cot since I left Iraq 10 years ago and I can say that I hadn't missed it a lick. I have slept on the ground and on the hood of a HumVee so there are worse things than a cot. And sleeping on a cot is easier when you've been working hard all day saving California. My deluxe living accommodations on the shore of Clear Lake. The State of California did a good job of recognizing the problem and then providing a solution. They pulled a 100 person base camp out of storage, loaded it on a trailer and and sent to to a County park a few miles from the County EOC/Casino. They assigned a California Incident Management Team to manage the Base Camp and these guys did an outstanding job. Instead of making me drive 45 minutes to Middletown to stay in the Red Cross staff shelter than let me sleep at the CALOES Base Camp, 5 minutes from where I was working. The tents were climate controlled and the showers were hot. The only slight disadvantage were the midnight trudges with flip-flops and my Gator Sweatshirt through the chill night air to the portalets. To this day I can't go to a portalet with thinking about Iraq but I couldn't complain about my luxury camping conditions. "People pay a lot of money to camp like this on the shores of Clear Lake, California" I said more than once to any of my fellow Campers who would listen. When the Lake County EOC shut down and I was reassigned to the DRO Hqs at the Adventist Church in St Helena, nestled on a hillside overlooking the spectacular Napa Valley, I was assigned to the nearby Staff Shelter. Because I allegedly snore (not having heard anything, I am unable to verify the allegation) I took up the offer to sleep outside in my own tent, sleeping bag and cot. Besides having to erect the tent in the dark (a task alleviated by the able assistance of some RedCrossers who took pity on me) I had no problems with these arrangements. Although the absence of heat, insects and reptiles were a plus. Putting up my tent in the dark outside the Red Cross St Helena staff shelter. As in all disasters, some things went well and some didn't. What California did well, at least in Lake County during the Valley Fire, was to make sure that accommodations were made in the shelters for those who had access and functional needs. The efforts by the responsible individuals in the Red Cross, the County and the State to make sure the toilets and showers at the shelters were accessible and that the animals were taken care of made this one of the better disaster responses (in this area) that I had seen. The burn scars from the Valley Fire around the city of Middletown in Lake County, CA. Like Floridians with hurricanes, Californians are getting wildfire responses down. This is an unfortunate business that the El Nino winter rains may alleviate. This will allow the Californians to work on their mudslide responses. I am still amazed at how few people across this nation are familiar with the amazing and historic story of how the state of Florida, at the request of Governor Haley Barbour, assumed emergency management responsibility for the six southern counties of Mississippi before Hurricane Katrina had even exited their state. Under the direction of then Director of Emergency Management Craig Fugate Florida moved over 6,000 local and state responders into the affected counties and purchased in excess of $180 million of supplies for the affected counties. I participated in this event and wrote an account of what I saw that was published in the Orlando Sentinel when I returned. This past week I have been posting pictures in social media to educate the public that New Orleans and Louisiana weren't the only places affected by Hurricane Katrina. Someone needs to write a book about what Florida did in Mississippi after Katrina and I have that task on my list of "Things to Do." Rand Naopli and Jeanne Pincha-Tulley, the Incident Command for Calif. Task Force 3, our U.S. Forest Service logistics partners, discuss plans in front of the Florida Mobile Command Vehicle. "Task Force Florida search and rescue teams, firefighters, law enforcement, ambulance transport capability and Florida Forest Service assets left long before sunup on the 30th and were on the ground and rescuing folks in Biloxi and Gulfport mid-day on the 30th. Everything that we had staged in and around Tallahassee that was meant for the Florida panhandle (which is where we thought Katrina might make landfall) went with us to MS."
to rural areas to treat survivors and provide water. "The search and rescue task forces were directed to drop off in Biloxi and Gulfport and got to work while the command team and other assets continued on to Stennis. We had been told that FEMA and the Mississippi Emergency Management Agency (MEMA) would be meeting us there and they would have their command established. It was several days before FEMA and MEMA had an operational presence on the ground in southern Mississippi." "Beginning the morning of Day 2 (August 31st), we sent dozens of units (usually a Fire Engine and an ambulance together) loaded with as much water and commodities as they could carry out into the 6 counties to treat survivors as needed and to leave water for them." "The plan was to stay for a few days, do primary search, treat any injuries and other medical issues we found, distribute the water and other commodities that we brought and come home when MEMA and FEMA were able to take over. That didn’t happen very quickly, and Task Force Florida turned into the Florida Area Command and stayed for months"
Some of the 300 trucks of water, ice and commodities that were staged at the Stennis Space Center and then distributed into the affected areas in the first days of the Florida Area Command..
"It became obvious immediately when we arrived that this was a long term event and that’s when I advised leadership at the Florida State EOC on a satellite call late that first night that southern Mississippi was hit much worse than even the folks at MEMA and FEMA realized (not to mention that the nation's focus was on New Orleans) and “we needed a bigger boat,” lots more people and that this would be a long term deployment." Because of Rand's phone call and other reports from the area, Mike DeLorenzo, the State Emergency Response Team Chief, and I spoke after the morning briefing September 1st at the Florida State EOC. Mike told me that there were considerable human services problems in the affected area and that he was going to recommend to Craig Fugate that I be deployed to the Florida Area Command at the Stennis Space Center to coordinate the mass care response. Later that morning I was directed to proceed to Mississippi. I recruited two other employees from my Department, Peter Newman and Candace Bunker, to come with me. We left Tallahassee on the morning of September 2nd and arrived at Stennis that afternoon into the middle of a catastrophic event, with instructions to try and make things better. We immediately had our hands full. But that's another story. I guess I'll talk about it when I write the book. What did Katrina teach us about responding to big events? "But why did we fail? The challenge was both at the local, state, and federal level. We found ourselves too often planning for what we were capable of managing and then hoping it never was any worse. And we thought that if those systems could respond to the day-to-day challenges, we'll scale up in a larger response. And what Katrina demonstrated is you don't scale up. So, you either build for the big events or you're going to fail." (Craig Fugate's response to a question about what we learned from Katrina, quoted in Politico.com). Craig said that the key lesson learned from Katrina is that jurisdictions (local, state and federal) must be ready for the big events when they happen if they want to respond in a manner that our elected officials and general public expect. When I put this quote out on social media, some emergency managers responded to the effect: "We can only respond with the resources given to us by our communities, and they aren't focused on Big Events." I don't think Craig meant that a municipality or a county must stockpile resources sufficient for the Big One. I think that there may be different interpretations of what Craig meant by "build for the big events." 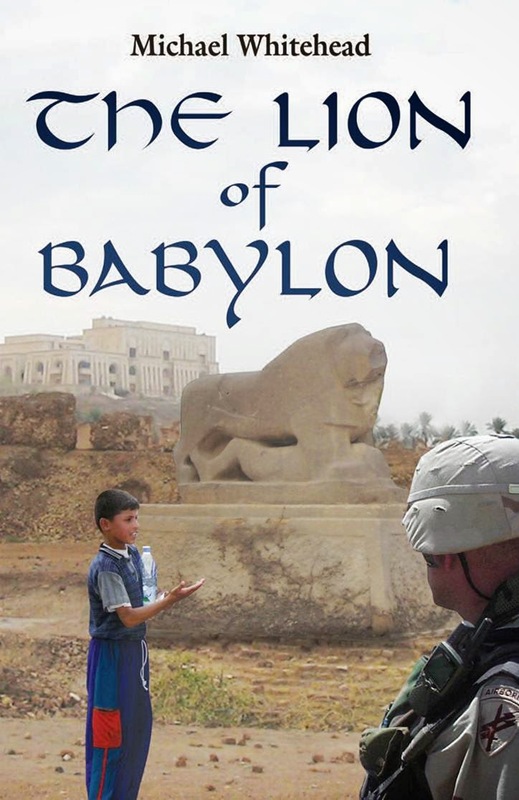 No jurisdiction is staffed for a catastrophic event nor will they ever be. Each jurisdiction, I believe, must be prepared to build and staff an organization capable of manging a big event when the time comes. I'm a State Mass Care Coordinator and I have no budget and no staff. 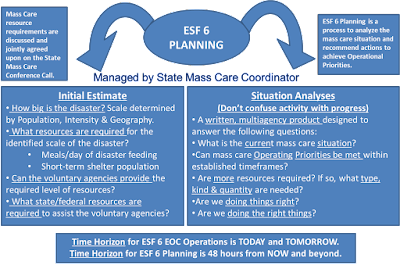 When, not if, the CAT 5 hits Miami I have to be ready to "build for the big event" to meet the enormous increase in quantity and complexity of mass care tasks that must be managed. We must design an organizational structure with written procedures tested and in place to meet this or any other catastrophic event. Personnel to staff this structure would be ordered at the time of the event through the Emergency Management Assistance Compact, Mutual Aid and through additional staff provided by the voluntary agencies. After much time and effort (but little expenditure of funds) that organization and those procedures were created and are available at our State ESF 6 website. 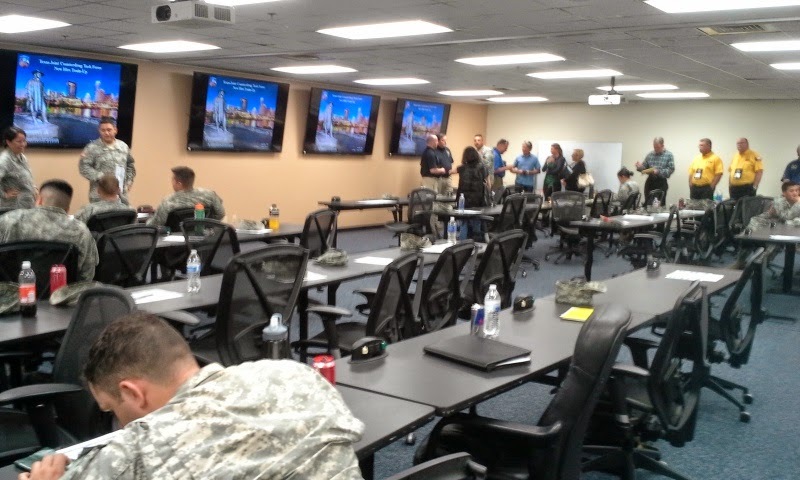 We tested and refined those procedures (to include the use of multiple mass care task forces) during the 2012, 2013 and 2014 National Mass Care Exercises held in Tallahassee in conjunction with the State Hurricane Exercise. The AARs for these exercises are on that same web site. 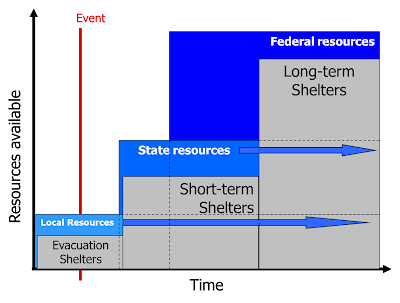 Rather than stockpile resources jurisdictions should plan to acquire the operational coordination capability necessary to manage the resources that will flow in like a tsunami when the Big One happens. The alternative is throw up your hands, tell FEMA to do it all, and then criticize their results. I wouldn't recommend that second course of action. Every state has mass care challenges but Alaska has some unique ones. I learned a lot about the intricacies of feeding and sheltering survivors in The Last Frontier during an Emergency Management Assistance Compact (EMAC) deployment July 6-22, 2015. Alaska asked for a Mass Care Coordinator and a Voluntary Agency Liaison (VAL) to assist with the Sockeye Fire that had affected Willow, a small community about an hour and a half north of Anchorage. Alaska picked me for the mass care job and Laurie Levine, a Red Cross employee who work with the state of Maine, as the VAL. Former Daytona Seabreeze HS & fellow UF Gator alumni Amanda Loach, now with the Alaska Homeland Security & Emergency Management, checking the information board at the Willow Community Center. Upon arrival Laurie was busy assisting the Willow community with the intricacies of long-term recovery and the case management process. When the mass care response ended after the first week I was able to make myself useful by writing initial drafts of state mass care plans and procedures. In my estimation the state did a good job with the mas care portion of the Sockeye Fire response because they had dedicated and competent professionals working not only in the State EOC but with the non-governmental organizations in the field. Unfortunately, the Sockeye fire response is to a 9.0 earthquake response as a pick-up baseball game is to the World Series. And to their credit, the Alaskan emergency managers I spoke to knew it. They learned this lesson during the 2014 Alaska Shield exercise held to commemorate the 1964 earthquake that rocked Anchorage. They realized that because they weren't prepared for a catastrophic mass care response, a lot of the response activities defaulted to outsiders who stepped into the void to do what had to get done. They wanted to stay in control of the mass care response no matter how big the event. In the face of a catastrophic mass care event a state can react in one of two ways. In the first instance, they could wring their hands, complain that they're not resourced for this kind of thing, and insist that FEMA and the Red Cross take over their mass care response. Of course, when the response is over they can complain that FEMA and the Red Cross did it all wrong, spent too much money and took too long to get everything done. The second choice would be to write the mass care plans and procedures that would allow the state to absorb the extra personnel required for a catastrophic event and yet still remain in control. After the lessons of Alaska Shield they decided to pursue this choice but didn't have the expertise to write the necessary plans and procedures. Fortunately for them, I LOVE to write mass care plans and procedures. I'm serious. I had a ball. I sat down with my Alaskan counterpart, Debbie Reed, and talked about the one week of the response that I had been able to observe in Alaska (I also was able to listen to some of their conference calls while I was still in Florida). Debbie was keen on getting a state shelter plan. Based on what I had observed of their response, I thought that they would benefit from having written procedures for their mass care response. And with that Debbie turned me loose. Most of what I did was copy and paste from templates and plans in my vast repertoire of electronic mass care documents. Then I went through and edited out non-Alaska terms (like "Florida" and "ESF 6"). Using this process I put together a first draft of the first ever State of Alaska Shelter Support Plan. This draft had all the easy parts of the plan: Purpose, Scope, Assumptions, Situation, and a start on the Concept of Operations. During the final out-brief to a room full of stakeholders I told them, "I did the easy part. I outlined the state shelter support tasks they must be accomplished during the various phases. You guys need to get together and decide which agency or agencies are responsible for each task. That's the hard part." Next I turned to writing a standard operating guide (SOG) for the Alaska mass care response. The first step in that task is to ask: Where does mass care fit within the Alaska state emergency operations center structure? 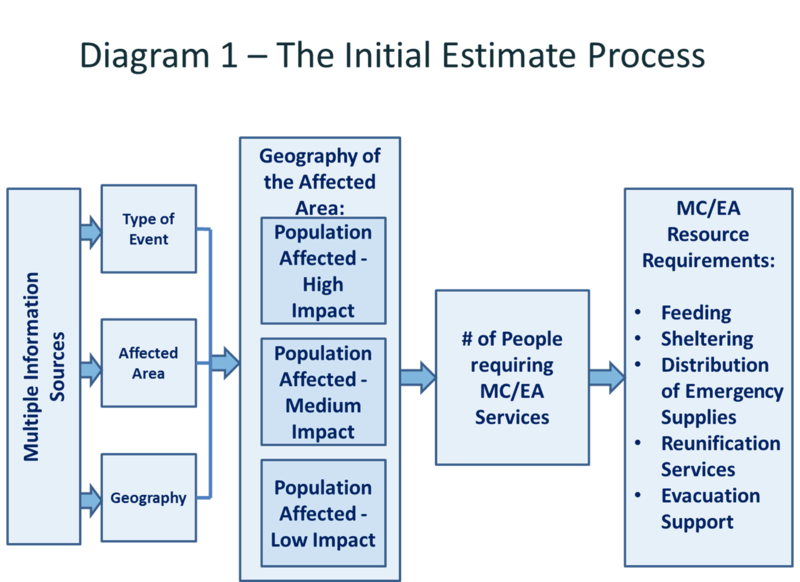 The answer to that question should be in the State Emergency Operations Plan (EOP). The EOP said that the State Mass Care Coordinator (Yay for Alaska for writing a SMCC into the Plan) would activate a Mass Care Task Force when required. During the Sockeye response they established the State Mass Care Task Force with four active subcommittees; Feeding, Sheltering, Volunteers & Donations and Pets. By the time I arrived each of the Subcommittees and the Mass Care TF were having weekly conference calls. 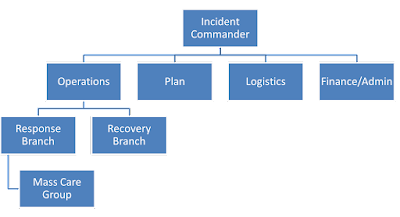 The Alaska State EOC is run according to the Incident Command System (ICS), with an Incident Commander and General Staff. Their Plans Section published an Incident Action Plan and I attended the 11 AM Tactics meeting. In the Tactics meeting they drew up the EOC structure according to the diagram below. When the time came to write the SOG I asked if we could change the name "Mass Care Task Force" to "The Mass Care Group". This way the name would be within the ICS convention and we would change the names of the Subcommittees to Task Forces. An advantage of this change would be that when we created the Mass Care Group catastrophic organization structure the outsiders who came in to help Alaska would more readily understand the task force concept than the idea of subcommittees. Debbie Reed (L), Alaska State Mass Care Coordinator and Amanda Loach (R). On the white board behind them is the "Mass Care Group" notation from the Tactics meeting. With that settled, I came up with various options for how the Mass Care Group could be structured and showed these options to Debbie so that she could pick what she thought best suited Alaska. Based on her feedback we created 3 structures: State Response, Federal Declaration Response and Catastrophic Response. 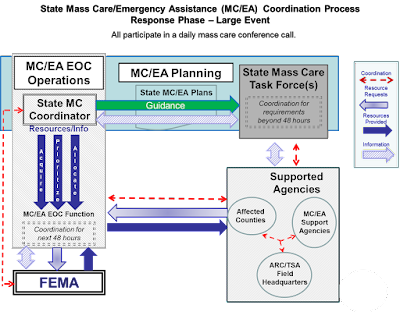 The Federal and Catastrophic Response structures allowed for an increasing number of personnel to be assigned to the Mass Care Group but the Group would always operate under the direction of the State Mass Care Coordinator. 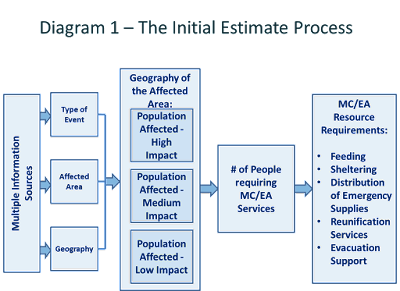 All of this was outlined in the draft Alaska Mass Care Group Standard Operating Guide. 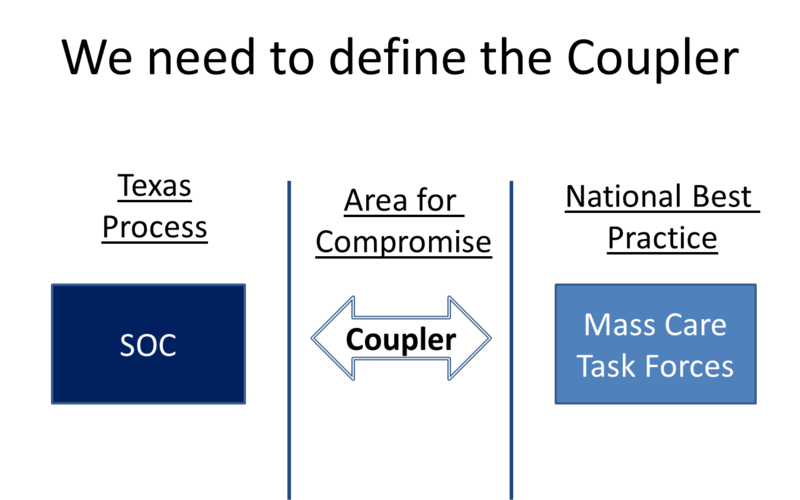 When required, and based on criteria that they will develop, mass care task forces will be activated within the Mass Care Group. 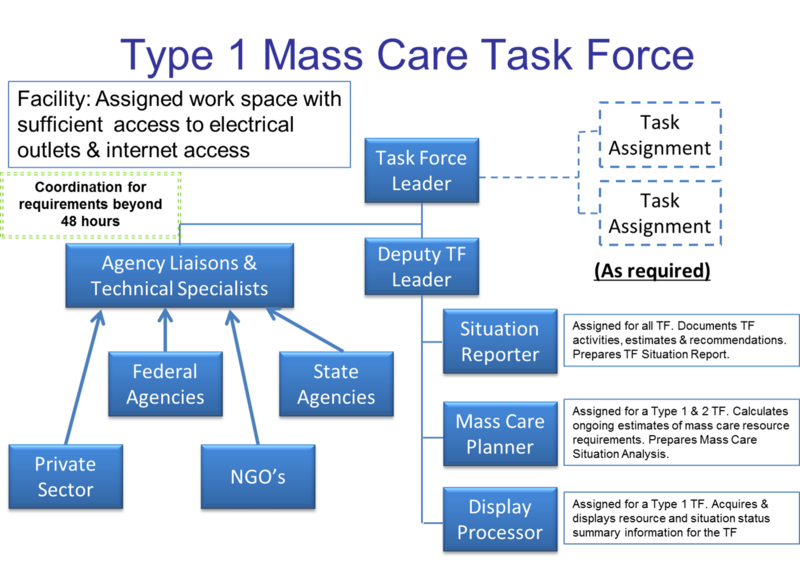 The mass care task forces will have task force leaders who will report to the State Mass Care Coordinator. Each task force will do planning and coordination for their assigned functional area. So that the task forces would have operational procedures to guide them I drafted a 3rd document, The Alaska Mass Care Task Force Standard Operating Guide. The SOG drew heavily from the Generic Mass Care Task Force SOG. These 3 documents were not drafted in isolation. During my first week in Alaska I was joined by John Fulton, the FEMA Region 10 Mass Care representative. John and I knew each other from Sandy and we discussed the concepts outlined in the 3 documents. As I was drafting the documents I also consulted frequently with Kelley McGuirk, the Regional Disaster Officer for the Alaska Red Cross, and Jenni Ragland, the Emergency Services Disaster Director for the Alaska Division of the Salvation Army. I admittedly gave them a lot of information to digest in a short period of time. It will take months for them to absorb these documents and determine how they should be modified to best suit Alaska. As everyone would agree, it's a lot easier to edit and document than create one from scratch. The whole experience of my time in Alaska was positive and educational. Never before, and possibly never again, will I attend an emergency management meeting where Dog Mushers are an item on the agenda. I am grateful for the kindness and courtesy that was extended to me by everyone that I met in Alaska. Who pays for mass care? A good friend has a saying: "Whenever anyone says that it's not about the money, you better believe that it's all about the money." 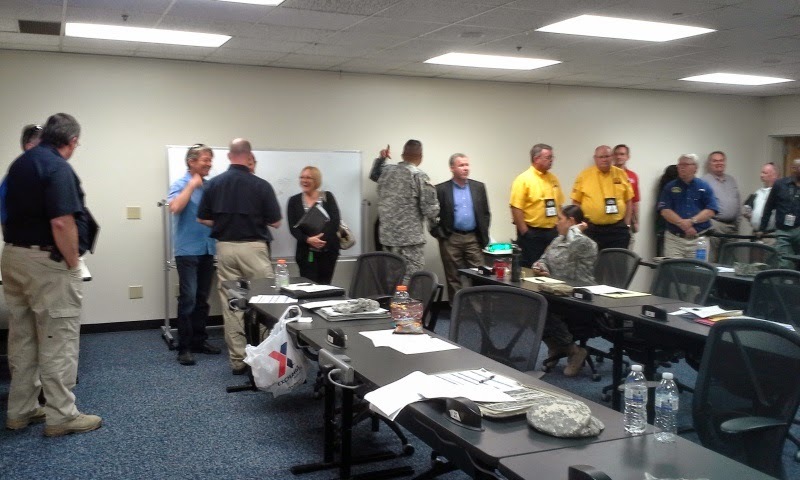 At the Hot Wash discussion at the end of last week's 2015 National Mass Care Exercise in Austin, TX we started a discussion about how mass care responses in large or catastrophic events are paid for. Actually, I made some statements about the topic and this generated a discussion. Chad Ostlund from Minnesota Emergency Management briefs Texas senior leadership during the National Mass Care Exercise in Austin, TC, June 2015. I'm going to lay out what I said but first the general reader (i.e. one who isn't a mass care or emergency management professional) will need some explanation to provide context for the discussion. By mass care we mean the provision during disaster of food, shelter, emergency supplies and family reunification. By disaster we mean the range of natural and man made incidents from a house fire to a Category 5 hurricane. Most of the time mass care resources are provided by the Voluntary Agencies Active in Disaster (VOAD) using funds that have been donated to them for that purpose. During blue skies the VOADs receive donations that they use to pay for salaries, training and exercises so that during gray skies they will have the capability to respond. When disasters happen the appeals go out to the public for donations to pay for the additional costs of the response. Big responses, with lots of exciting video footage of destroyed buildings and dazed survivors, generate a much broader and deeper response from the public than a smaller incident that may only make the newspaper in their community. The result is that the VOADs often pay the mass care response costs for the smaller or less publicized disasters with blue sky money. The old emergency management joke defines a disaster as when a tree falls on your neighbor's house and a catastrophe is when a tree falls on your house. Regardless of whether the disaster is federally declared or not, or whether the storm made good video for the Weather Channel, when the tree falls on your home and you're poor and uninsured you've got troubles. And if your county ended up on the list as declared for federal Individual Assistance, the maximum amount that FEMA can give you is $31,000. The average handed out by FEMA is only about $5,000. The VOADs are left with the task of matching the donated dollars they've received with the unmet needs of the survivors. The gray sky money donated by the public, whether through the "Text $10" appeals or by other means, must pay for response costs as well as the unmet needs of individual families that are uncovered through case management during recovery. One VOAD indicated that two thirds of the gray sky money that they receive arrives within 5 days of the event. The pot of money that each VOAD can devote to a disaster is therefore fixed and finite, and most of the donated dollars arrive early in the disaster. Some state and local government aren't inclined to help out during the mass care response. In one of the many storms of my past a member of the Governor's staff, who shall remain nameless, asked me, "Why are we giving truckloads of bottled water to the Red Cross?" "Because they're handing out the water to our citizens," I replied. "They should buy their own water with the money the federal government gives them," said the staffer. "The federal government isn't giving the Red Cross money." "Oh really, they are," said the staffer in a tone that was meant to conclude the conversation. Fortunately, someone other than me was able to educate the staffer and the Red Cross got their truck of water. In another state and another disaster I had an emergency manager question my request to send a truckload of water to the Salvation Army. "Why should we send them a truck of water?" he asked. "Because they're handing out the water to your citizens," I replied. The EM frowned. "That community already has ways to get their own water." 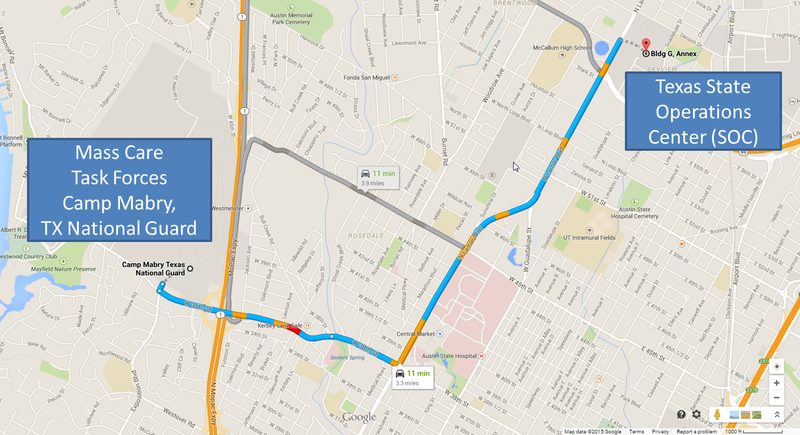 I nodded my head and walked away. Fortunately, someone other than me was able to educate the EM and the Salvation Army got their truck of water. This sets the context for the statements that I made at the conclusion of the National Mass Care Exercise. My contention (and I am not alone in this belief) is that during a federally declared disaster the state government, to the extent responsible, should support the activities of the mass care VOAD agencies through the purchase of logistics and supplies. Examples of logistics that can be provided are forklifts, pallet jacks, portalets, dumpsters, bulk water, propane and diesel. Examples of supplies are bottled water, ice, shelf stable meals. baby supplies, shelter supplies and food for preparation at the field kitchens. In a large disaster the costs for these items would be millions if not tens of millions of dollars. Whether the state purchases the resources or asks FEMA to do so 75% of the costs are a federal responsibility. And for every dollar of response costs absorbed by government there is another dollar available to the VOADs weeks later to help meet the unmet needs of the survivors. "So why should the states help out the VOADs during the response?" you ask. So that they can use the money they save to help the survivors when the government is not in a position to do anything more. And that's a good strategy for any government to follow.